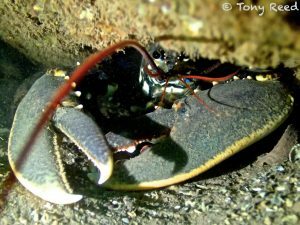 The next in our series on great local diving looks at diving the wonderful Babbacombe Beach. This is where many new PADI Open Water Divers go for their first independent dive trips. These divers are likely to keep visiting for many years to come as there is so much to see at any time of the year. Put the postcode TQ1 3LX in your satnav to get to the site. Your journey ends on a steep, narrow lane but the Cary Arms is on this road - If the beer delivery lorries can get down here - so can you! The car park at the bottom is right next to the beach but it isn't massive. This isn't a problem most of the time but on summer weekends you should get here early. No dive day is complete unless some catering options are built in. The beach cafe is open somewhat intermittently but is usually serving at weekends in the season. 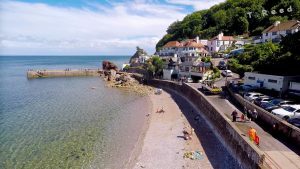 The Cary Arms is a great pub and restaurant just by the beach and at the top of the hill, Babbacombe has plenty of decent cafes and restaurants to choose from. Have a look at the Beach Webcam. It sits on top of the cafe and gives a good view of beach conditions. Babbacombe is a sheltered site but easterly winds will spoil the diving here. Maybe think about Chesil Cove when the wind direction is from the east. Diving at Babbacombe is pretty straightforward but watch your footing getting in and out of the water. Keep away from the jetty if people are fishing there. Boats use the bay so use a marker buoy from the start or have one ready to send up if you hear boat traffic. There are plenty of ways to dive from the beach. To get a good overview try swimming out towards the jetty (watch out for people fishing though) on a North Easterly bearing. The gradually sloping, rock and weed covered bed will drop off quickly by a metre or so onto a siltier bottom. In this area, there is likely to be plenty of lost fishing gear so watch out for tangling. I like to take a bag and a cutting instrument and remove some of this. Lost fishing gear can continue to catch and entangle marine life for years. Swim along this drop-off, looking out for marine life as you go. You are swimming across the bay now. 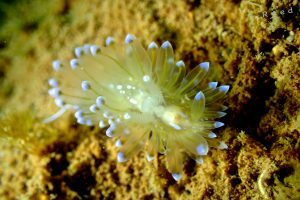 Look out for "Mushroom Rock" which is a well-named feature where much marine life including cuttlefish, anemones, tiny nudibranchs and the like are to be found. Make sure to spend plenty of time around the rockier area on the western side of the shore. 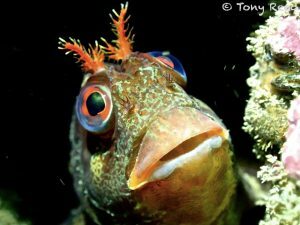 Shoals of small pollock are to be found, cuttlefish in season, crabs, lobsters...and much more. Finish by heading back across the bay towards the east before turning in to finish in the middle of the beach - 10 brownie points for being opposite the steps up to the carpark. On other dives, you could head straight out to mushroom rock on a N bearing from the ramp. You could go further west to find a seagrass bed and look for pipefish, maybe even an elusive seahorse. At very high tide you can get in on the other side of the jetty, or just swim around the jetty if it is safe to do so. 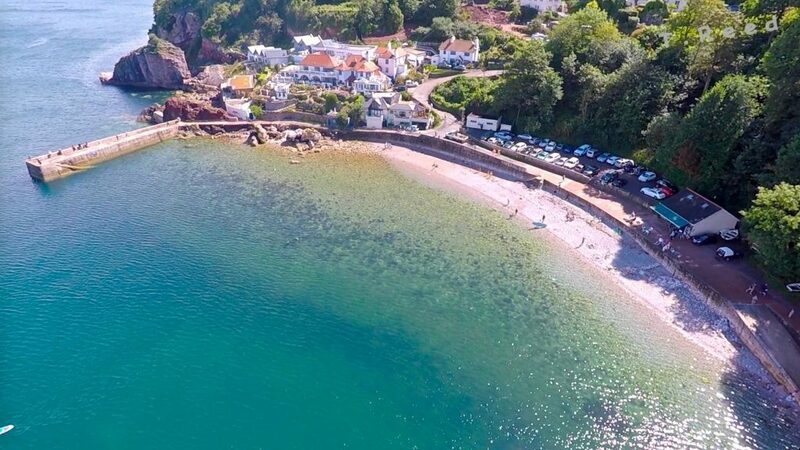 There is always plenty to explore at Babbacombe and it seems to change every time you visit. 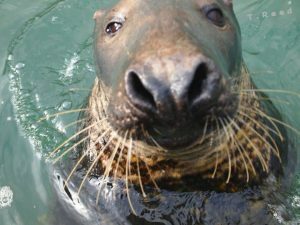 For air fills why not call in at Scuba Blue, just 15 minutes off the M5 at Dunkeswell. 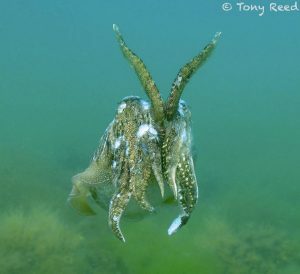 All the pictures on this page were taken at Babbacombe by the wonderful local underwater photographer, Tony Reed. Check out more of his work at his blog http://cheapandcheerful.blog and look out for his photography workshops with Scuba Blue.